Love the look and the offset was perfect. 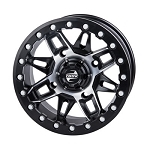 Awesome price on these great wheels. Received them super fast and easy. The option for text message made the process even quicker when they checked to make sure I was getting the correct lug nuts for the machine. Have bought from them before and will be placing more orders in the near future! rims (wheel) came in a timely manner. they are mounted and ride great. plus they look pretty pimp. will buy from you guys again. outstanding service guy, keep it up!!! Very nice wheels at a great price,gave my 900 a little wider look. Love the wheels we purchased for our 2015 Teryx4. The customer service reps are very helpful and friendly. Fast shipping too!! We will continue to be Pure Off Road customers for sure. Love these rims. Look great on my canam outlander. Wheels are the best by far. 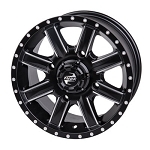 They help improve the ride and give your rig a clean stylish look to have you turning heads! 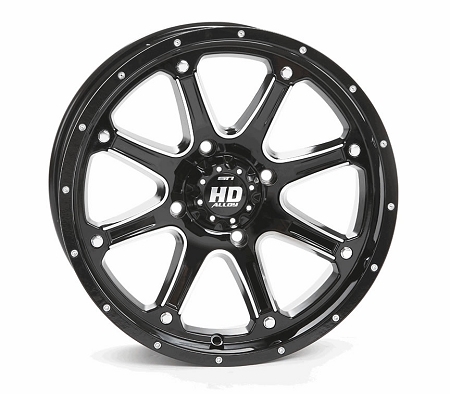 Q: Will this wheel fit a 2014 Odes Dominator 800 UTV? 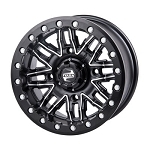 A: We would need to figure out the bolt pattern on that machine in order to find out if these rims will fit. I would guess it has a 4/110 bolt pattern, can you check that or give us a call and we can help you determine that. 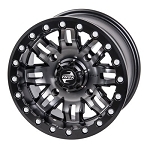 Q: I want to make sure these will fit my 2016 TRX500FA6 Forman Rubicon 4x4? A: Yes they will, just select whether you have a Straight Axle or Independent Rear Suspension from the pull down on this wheel. Q: I have a 2018 Kymco 700i LE Prime. I have 26x9 14 inch tires on front and 26x11 14's on rear. I am trying to set up a spare tire and wheel. I believe the pattern is 4-110. Will this wheel work? A: Yes this wheel will work with your tires. I don't have any information on the Kymxo machines, if your bolt pattern is for sure a 4/110 then yes this should work no problem.